Protected areas play a very significant role in the conservation of medicinal plants and traditional knowledge. Chandra Prabha Wildlife Sanctuary (CPWLS) is situated in the district Chandauli. The presented study was carried out in the area of CPWLS for survey and collection of medicinal plants. Information on medicinal properties of plants encountered in the present study was generated through surveys and relevant literature. A total of 121 medicinally important plant species were reported. The present study aimed to document the traditional uses of different plant parts of medicinal plants. 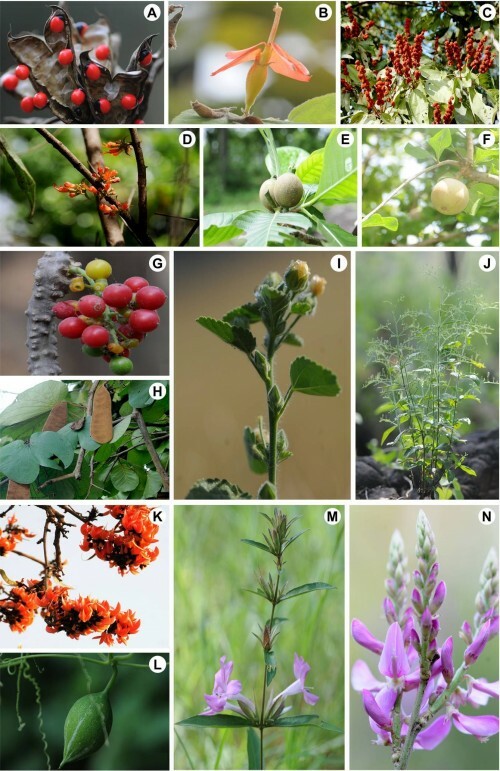 Present study of diversity of medicinal plant in CPWLS is helpful for information on medicinal values of plant species will also be helpful in conservation of these plant resources. Fig. : Some medicinal plants of Chandra Prabha Wildlife Sanctuary: A, Abrus precatorious L.; B, Helicteres isora L.; C, Mallotus philippensis (Lam.) Mull. Arg. ; D, Woodfordia fruticose (L.) Kurz; E, Gardenis latifolia Sol. ; F, Aegle marmelos (L.) Correa; G, Tinospora cordifolia (Willd.) Miers; H, Bauhinia vahlii Wight & Arn; I, Sida cordifolia L.; J, Andrographis paniculata (Burm. F.) Nees; K, Butea monosperma (Lam.) Taub. ; L, Trichosanthes cucumerina L.; M, Barleria cristata L.; N, Indigofera cassoides Rottler ex DC.